Sports Costs > How Much Do Karate Lessons Cost? Whether you’re looking to learn self-defense, or you want to partake in a karate class for exercise purposes, you’re going to find that there are many reasons you should consider taking a class in your free time. 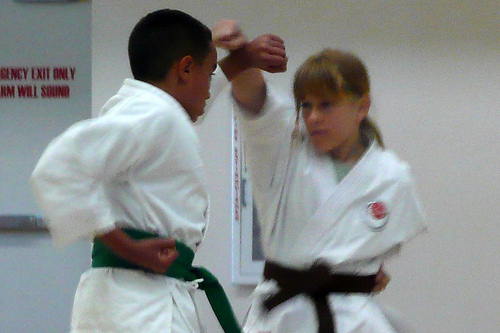 Some types of karate include Tae Kwon Do, Aikido and Judo. These classes are usually opened to both children and adults. Your typical karate classes are going to be held once a week, and these classes can range anywhere from $50 to $150 a month. Local parks and recreation classes will be $50 to $75 per month, while a private studio will be about $100 to $150. We were able to contact a handful of reputable karate academies and noted the prices in our chart below. Some courses may require you to pay in semi-annual packages. If this is the case, you may pay around $275 for 3 months or $750 for the year. The more classes you purchase ahead of time, the more you will be able to save. Classes at the YMCA, for example, may run about $50 a month. For instance, at this YMCA, the classes will cost $67 per month for members. Karate uniforms usually aren’t included with the price tag. Your typical karate uniform will run anywhere from $10 to $75 a set, depending on the quality and where you purchase it. Additional tests to receive a belt may cost you extra. For example, some Dojos may charge up to $200 for testing. If your class requires you to use weapons, such as nunchucks, then you may have to purchase them. These weapons could cost $10 – $85+. While it’s optional, some courses will offer tournaments. If you want to join the tournaments, there will more than likely be an entrance fee. All classes are going to vary. Classes will generally be broken down in beginner’s, intermediate, advanced, weapons and teams. On occasions, you will find that the uniforms will be included in the price. Try your best to pick out a school that has no contracts. This way, you’ll be able to get out if you’re unhappy with the services. Be sure to always compare at least three to five prices. You’re going to find that schools are going to greatly vary. Talk to the instructors ahead of time. What are their attitudes like? How long have they been teaching? Most instructors are going to be able to answer any questions that you may have. If the instructor turns their head to those that are new, it may ideal to find someone else. Most schools will offer a free lesson. If they do, this is a great way to swoop in and take advantage of these deals. It will give you a good idea on what the school can do for you or your child. The best thing to wear to your class is loose fitting pants and a t-shirt. Try to avoid jeans and dresses. Experts recommend you wait until your child is at least six years old before signing them up. Children younger than six often have a short attention span and are unable to keep focus. If you want to sign your younger child up, however, some instructors do offer classes for those younger than five years old. What kind of affiliations do you have? Do you have any type of international affiliations? Who did you train under in the past? Do you have a black belt certification? Do you have an instructor’s license? How often do you go for training? Consider taking classes at your local YMCA. This is one of the cheapest places to go. Try registering in groups as many karate schools will offer a discount. If you purchase months at a time, you may receive a discount this way as well.